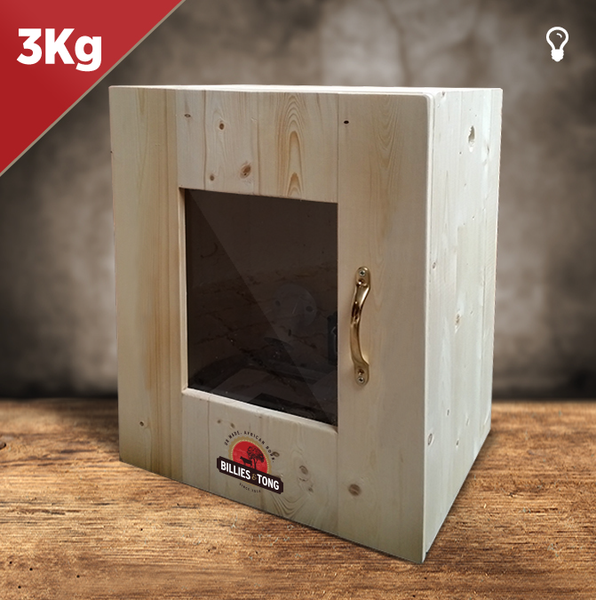 This is a custom made biltong drying box in pine that comes plain or with a **personalised name on the front of your choice. The boxes come in a pine, teak effect, white wash or oak effect. The box works with a 40w bulb and a small fan. With the two together it creates a constant warm air flow for drying. *The 40w bulbs are now becoming harder to buy do to most people requiring energy saving bulbs, please bare this in mind when choosing between a bulb dryer and a heat element dryer. It is a misconception that heat is the the key ingredient that dries the biltong. Heat is required to lower the humidity as here our British climate is very humid compared to Africa , it is the air flow that dries the biltong. After all, the whole concept of biltong is it being air dried, so don’t worry too much about the heat, we aren’t wanting to cook it! This box can hold up to 3kgs of meat. Drying time is 3 to 4 days depending on your cut and your own preference. Door latch for easy and secure access. 100g of Billies & Tong original biltong spice to get you started. Full user instructions and basic recipe. FREE shipping on domestic dryers to mainland UK. PLEASE NOTE EACH BOX TAKES 7-10 WORKING DAYS TO MAKE AND POST (weekends not included).